New Seasonal Templates –– Just in Time for the Holidays! Great news! We’ve just released a handful of new Listing Templates that are perfect for the upcoming holidays. Listing Templates are a powerful marketing tool you can use to help boost sales for your seasonal products and gifts.They allow your buyers to see all of the fine detail and unique attributes of your products, meaning they’re likely to purchase quicker. It’s easy to add these templates to new products by using the Create New feature or by editing your Scheduled and Closed listings. Plus, you can also add Listing Templates in bulk to your Saved listings by using the “Advanced Edit” tool. 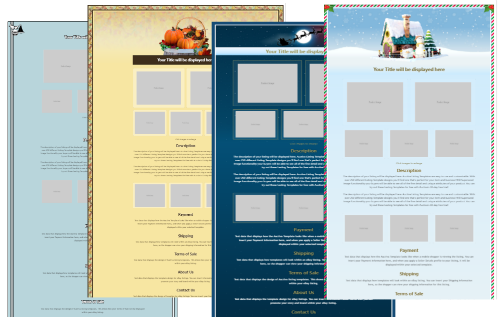 With the addition of these new Listing Template designs, we now have a total of 12 Thanksgiving themed templates, 2 Christmas, 3 generic winter holiday and 2 New Year/firework designs available. You can easily check out these holiday templates by looking in the “Holidays” category in the template selector.